Learn five easy watering techniques that save water AND time watering your garden while cutting down on chores, creating healthier plants, and allowing you to enjoy your garden more. How are your gardens growing? 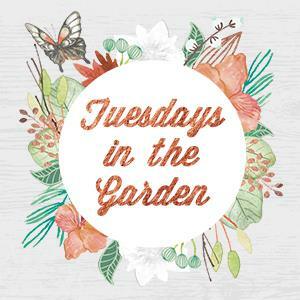 Today’s Tuesdays In The Garden group is bringing you lots of summertime planning tips, from how to save water and time, to keeping your garden going during vacations. During the warmer months, it seems like all we gardeners do is water – pots, vegetables, shrub and flower borders, and of course lawns. It seems that as soon as everything’s been watered, it’s time to start the whole rotation again. While the chore of watering can’t be eliminated completely (unless you have everything automated, which would be amazing), there are some ways you can save water and time watering, making it easier for you and your plants. Using these tips will help the environment, too, because you’ll actually use less water than overhead watering from standard sprinklers or hand watering. That’s a win! 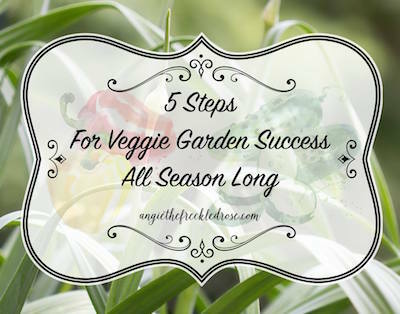 These watering techniques that I’m sharing with you are my absolute favorites – I have used them for years and I can promise that if you don’t have an automated sprinkler or drip system, these easy tips are the next best thing to cut down on the chore of watering – whether it’s flower borders, vegetables, or keeping your flower pots watered while on a vacation. 1. 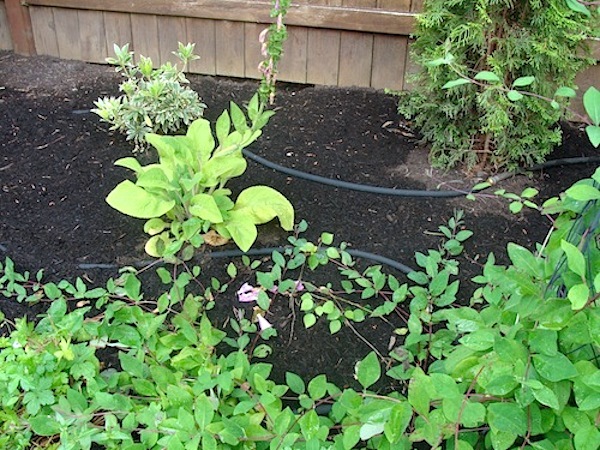 Lay soaker hoses in beds, borders, and garden rows. How: Simply hook a soaker hose to your main hose and let it soak the ground for two to four hours every 5 to 7 days, depending on the bed’s location (for example, beds under trees will need more moisture), the weather, and your home’s water pressure. To know how long for your garden, use your finger to see if the soil is moist 1-inch down (about to your first knuckle) – if it is, then the bed has received enough water (this is also the way to see if you need to water – too much water isn’t good for plants, either). Why: Less frequent, deep watering creates healthy, established roots that can withstand dry spells easier. Extra tips: Invest in quick connect hose ends that make hooking the main hose up to the soakers a snap – literally. 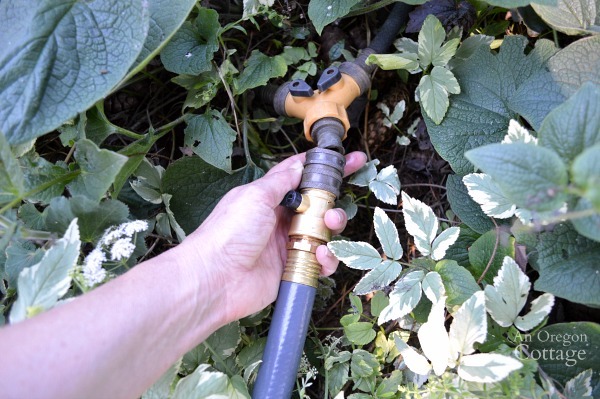 And when they sprout a hole (they will, eventually…) here’s how to easily repair soaker hoses. 2. Lay down newspaper or cardboard and mulch. 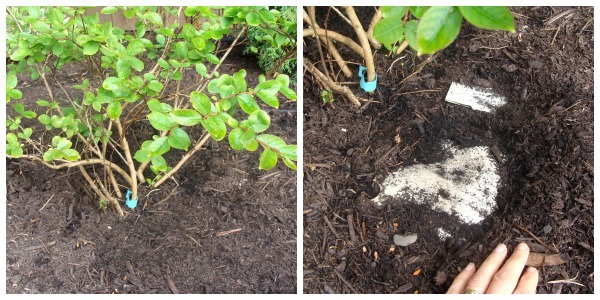 How: Cover bare, moist ground with 5-8 layers of newspaper (or 1 layer of cardboard), top with soaker hoses, and then with a layer of dark-colored mulch (see our video here for step-by-step tutorial). 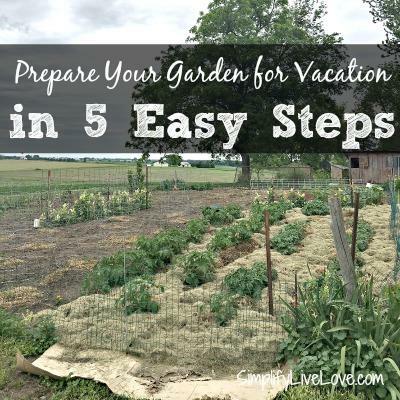 In the vegetable garden, lay paper (or plastic mulch like red for tomatoes and black for peppers) between the plants and on the paths before covering with straw or grass clippings. Why: This tip makes the soaker hoses even more efficient by helping to regulate soil moisture and not dry out as fast. It’s especially helpful in the vegetable garden, as some plants will become stressed with uneven soil moisture (example: blossom end rot on tomatoes is caused by this as well as low calcium in the soil). 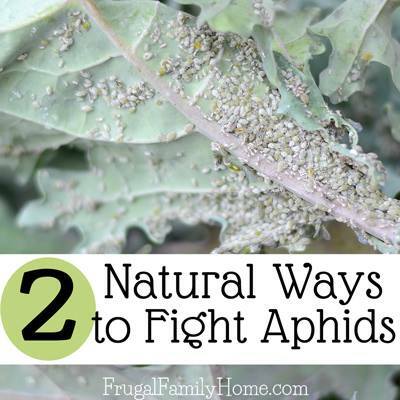 Extra tip: This is also the secret to a weed-free garden, which I’ve written about a lot because gardening became SO much easier after I started implementing this in all my garden areas! 3. Use large pots for flowers. How: Use pots at least 12 inches in diameter, but aim for 16 to 24-inch (or larger) pots and keep them close to your house for the easiest access. 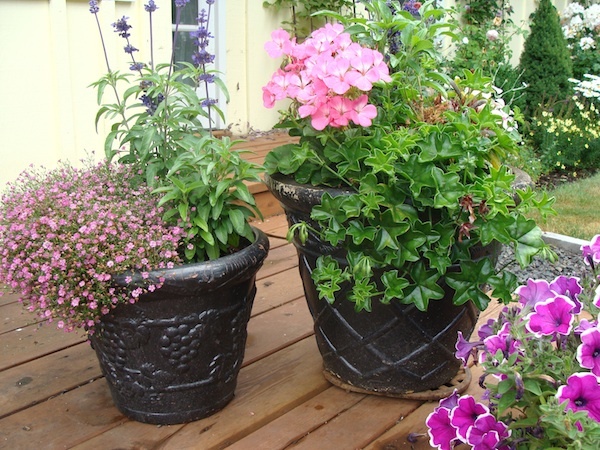 Why: Larger pots hold more soil and require less frequent watering. Extra Tip: Unglazed, terra cotta pots lose moisture incredibly fast – invest in glazed or unbreakable, ceramic-look planters. 4. Add water absorbing crystals to your pots. How: Add a teaspoon to a tablespoon to each planter, depending on the size, and mix it into the soil at planting time. The water-absorbing crystals look like rock salt, but they soak up water becoming 10-20 times larger and then slowly release it back into the soil. Why: The crystals help keep the water at the plants roots longer. This is my #1 tip to lush pots even in the hot heat of summer (see my other tips here – you won’t be sorry!). Extra Tip: These crystals are sometimes hard to find, but you can usually find them in most nursery centers in the potting section as well as online at places like Amazon. 5. Use a kiddie pool for vacation watering. How: It was so freeing when I discovered this technique! Instead of paying a neighbor or imposing on your family, place all of your small to medium (but of course, not that small, if you’re using tip #3!) 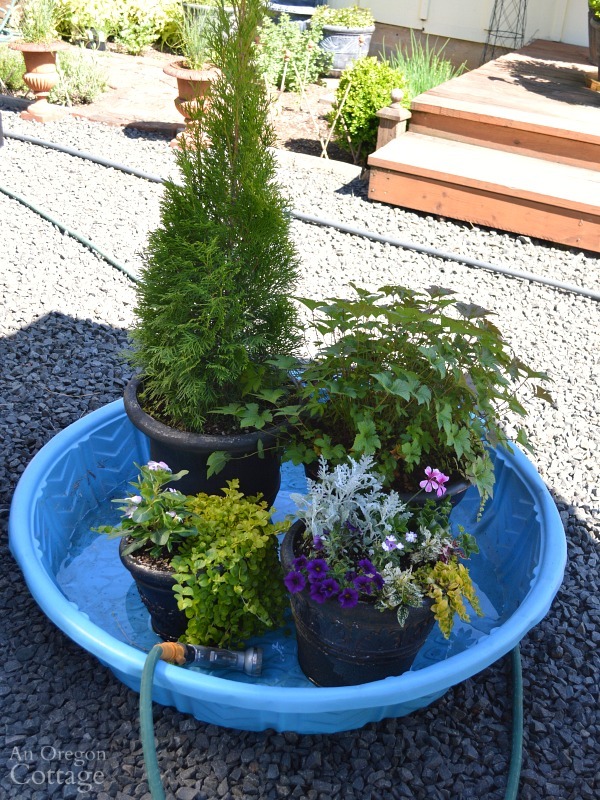 pots into a basic plastic kiddie pool and fill with water. The water will last 4-5 days, even at the height of summer, before needing to be refilled. Why: Your pots will take the water up from the bottom and stay hydrated for about five days. Extra Tip: If your vacation is longer (like a full week) the pots may become waterlogged and show some browning, but they should bounce back once removed from the pool (unlike if they are burned from drought). I’ve found 3-5 days is about perfect, though I have used this successfully for week-long vacations. So there are my five tried-and-true watering tips that help us through the summer – what about you? 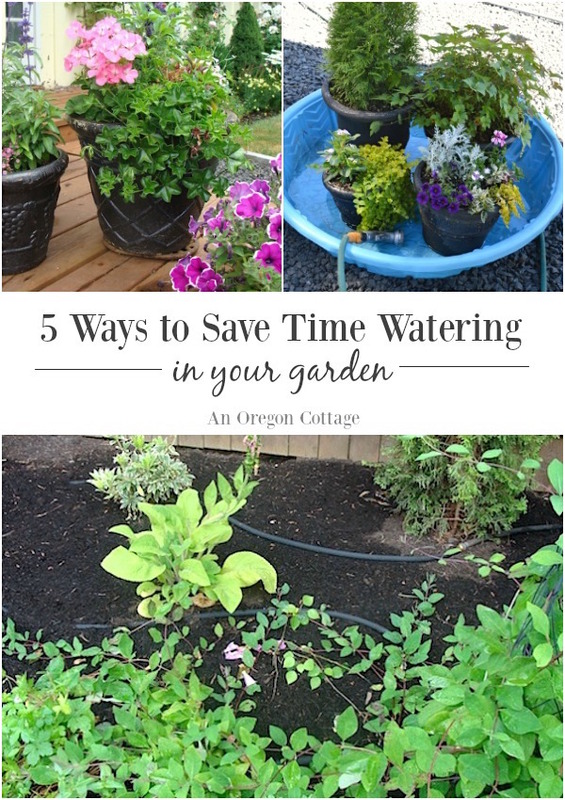 Do you have some favorite tips you use to save water and time in the garden? very smart and can save a lot of time! Thank you! I would love for you to come participate in our Blog Hop. The Homesteader Hop every Wednesday, I do hope you will come out and join us. I bought a timer for the hose. BEST THING EVER! Attached the hose to the timer and then to a sprinkler that covered the whole garden. I’ve tried so many timers over the years, Tracy, and they’ve all stopped working before the season is out. 🙁 Now, I always get cheaper timers – can you share what timer you got and how long it’s been working for you? I’d love to get one I know will work! Sure. I have the Orbit 62024 Single-Dial Hose Watering Digital Timer. I purchased it from Amazon. Last year was my first year using it but it worked fine all season and I absolutely loved having it. It made gardening so much easier and things just kept rolling along if we went out of town or if I just got busy with other things in life. I would definitely purchase again. Oh, thank you Tracy – I’m going to check that out! Thank you, Jami!! Watering can be calming as well as time-consumptive. I MUST try the kiddie-pool idea! 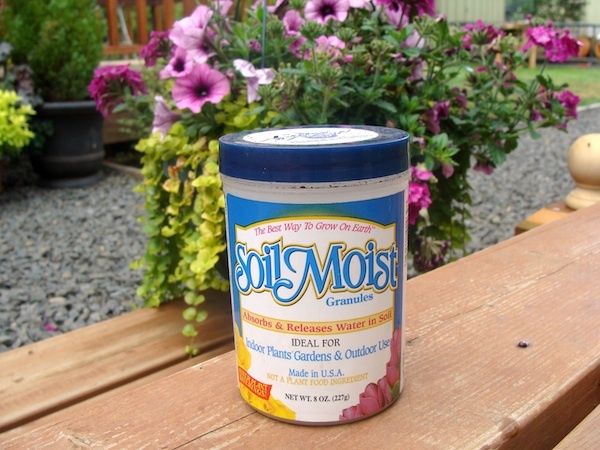 Also, I am wondering about the Soil Moist product. Some time ago, I saw someone remove the innards of diapers and pads and mix that into soil. Have you tried that option? If not, do you know anyone that has and their results? I ask because I just happen to have some adult diapers I can either donate or maybe use some of the materials inside. Thanks! I actually did a test on this last year, Andi! Started it in this post and then posted the results here: so I can’t recommend using the inside of diapers vs. soil moist. :( However, I’ve heard of people lining the bottom of baskets with a whole diaper and since that may act as a barrier to hold water in, it may work for that. We’ve been watering like crazy with all the heat we’ve been having so early. I love the idea of a kiddie pool. Our neighbors use a timer to water and it works well too. I like to add the water crystals to all my potted plants, it really does help to keep them looking good. We use an automatic watering system for our garden and greenhouse. 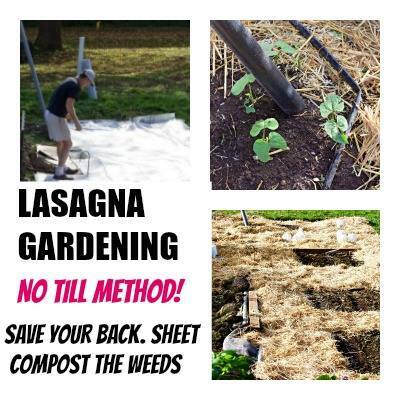 This year we are also adding your suggestion of cardboard and plastic under mulch! Great tips! Soaker hoses are fantastic for flower beds. I love the idea of a kiddie pool to save pots on vacation. Great idea! Thanks, Diane! What auto system have you been using for your garden? I would love to find something that actually works! Hi Jami, We use Aqua Tec. It’s inexpensive and easy to set up. Good Luck! we run a ” grey water” system using the laundry water for the garden but I don’t use soap for laundry, I use ecoballs so there are no soap residues in the water we put on the garden. I’m in the process of getting soaker hoses for all of our garden beds. I’m hoping it will make watering easier next summer. I need to get some of thsoe granuals. I’m terrible with pots. One of my favorite posts! Thank you! Question: when you put the soaker hoses over the layers of paper or cardboard, does it soak through ok? It seems like it would take a long time for cardboard to get wet and for the water to actually get to the soil. Glad you liked it, Jennifer! I only use cardboard in early spring when the ground’s really soaked, and only in areas I don’t want to plant anything through later on (like between shrubs). It does fine for me. And the newspaper soaks really easily – that’s not an issue. The newspaper really only lasts one season, so it’s best if it’s replaced yearly – especially if you’re using it for weed suppression, too. The pool idea is EXCELLENT! Thanks for the tip!